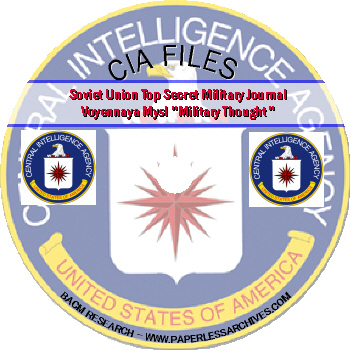 Journal Voyennaya Mysl "Military Thought"
15,451 pages of CIA files related to intercepted articles published in the Soviet Union's top secret military journal Voyennaya Mysl. Voyennaya Mysl is translated from Russian to English as "Military Thought." 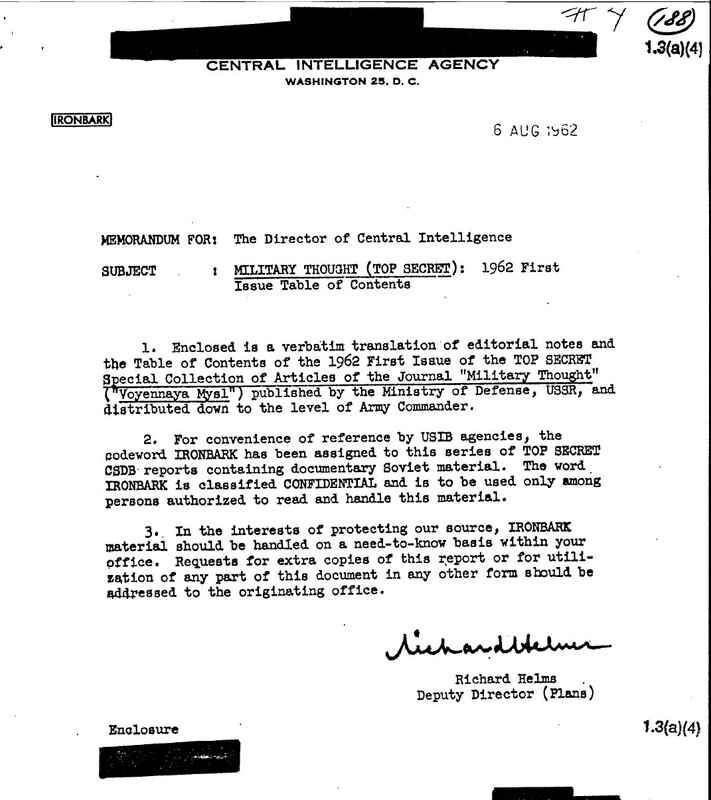 The files date from 1961 to 1982. 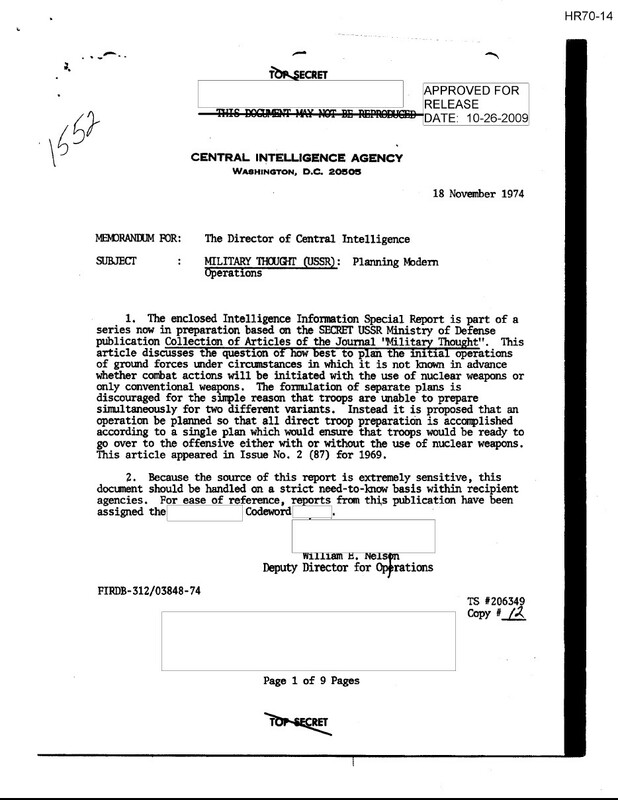 Some material in this collection was not released by the CIA until October 2012. Much of the Soviet material from the early 1960's was provided by Oleg Penkovsky. Oleg Vladimirovich Penkovsky, given the codenamed HERO by the CIA, was a colonel with Soviet military intelligence during the late 1950s and early 1960s who spied for the benefit of the United States. 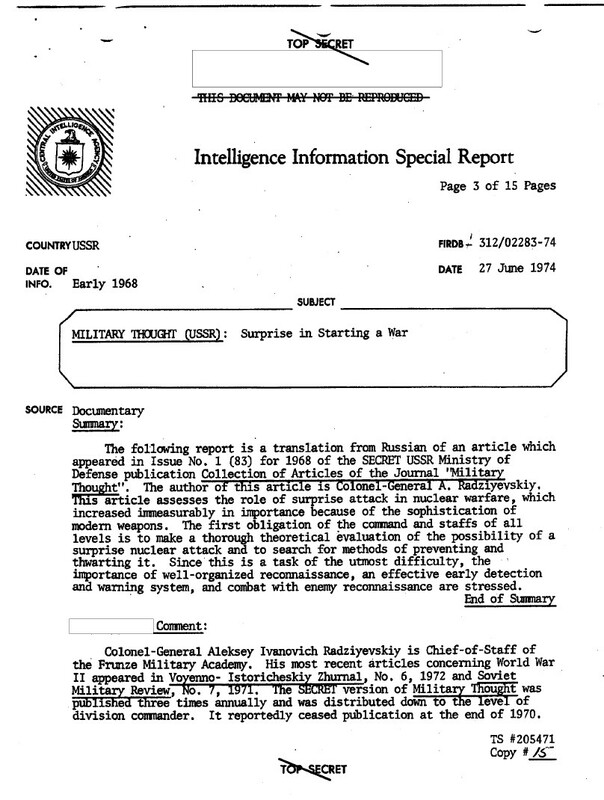 The material in Military Thought is key to understanding Cold War Soviet and Warsaw Pact military strategy. This military journal was founded in 1918. From 1947 to 1989 Voyennaya Mysl became a top secret academic journal for the Soviet military elite. During this time each issue of the journal was marked, "Only for Generals, Admirals, and Officers of the Soviet Army and Navy." Created by the Russian Defense Ministry, the journal's contributors were top military personnel and leading lecturers from Russian military universities and colleges. "Military Thought" provides a view of the development of Soviet military theory, Russian military reform, tactics and strategy of modern combat, and military operations. Other documents cover lessons and activity at the General Staff Academy of the Armed Forces of the Russian Federation. The Academy was the senior Soviet school for officers made up of the "best and the brightest" officers of all the Soviet Armed Forces. Students in this academy usually held the rank of lieutenant colonel, colonel, and General-Major (one star). Most were colonels or newly promoted generals usually in their late 30s. Graduates who were not already generals or admirals usually were promoted to this rank after completing the academy. According to William E Odom, the author of "The Collapse of the Soviet Military", faculty and students of the General Staff Academy were involved in debates over Soviet military restructuring in the last years of the USSR. 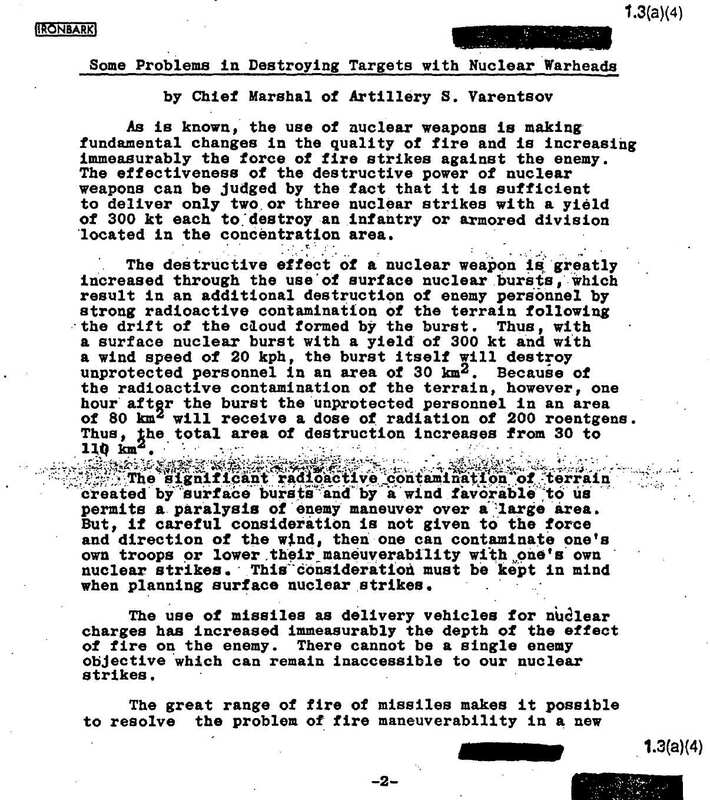 They became associated with the military reform efforts of Major Vladimir Lopatin and made specific suggestions for deep force reductions. 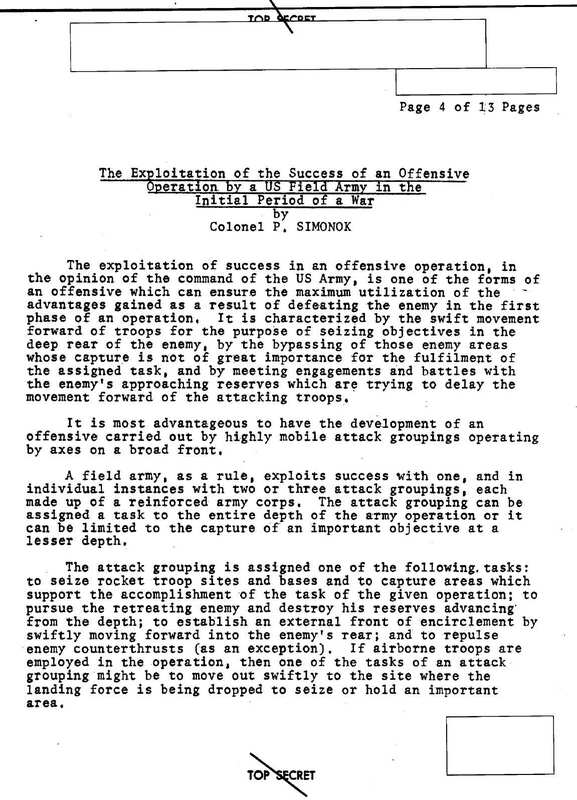 Additional CIA material covers symposiums on military science, translations of top secret military text books, and the journal Field Service Regulations of the Armed Forces of the USSR.